Heal Your Puzzle » Blog Archive » Frustrated by your Healing Journey? Frustrated by your Healing Journey? When you are born, you enter this world with a Subtle Field full of potentials and, combined with your family heritage, your life begins. As you grow you learn you are in a Physical Body with five primary senses: touch, taste, sight, hearing, and smell and you begin to express who you are in the World by creating relationships with your environment and the people around you. As you become a confident caring adult, you may be naturally drawn to a particular career, have a fulfilling relationship and really enjoy life socially and emotionally and experience a wonderful feeling of love for the World and your family and friends. Idyllic? Does this ever happen in Reality? Has it been like this for you? Or has it been more challenging and frustrating? 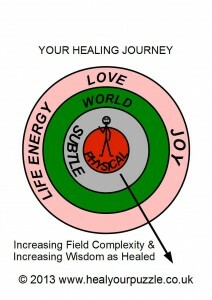 … is the same for every single one of us, maybe not in content but in its destination… Joy & Love 🙂 The picture shows the structure of your Field when it is on a journey towards this natural flow of Life Energy. The frustrating part of this journey is that it may take some time for your Field to take this organised form. The most significant amount of time is spent in the early stages of healing when your Subtle Field, your Mind, has to learn about itself: how it is currently structured if at all, learn what structures are needed, how to be organised and how to communicate within itself. When the Mind is ready, communication will begin with the physical body but until that point there may be no apparent physical changes to be seen in the Body or in your Life but the inner emotional journey may have been immense. The next phase, after the Mind-Body, is about connecting with the World and then how to achieve a natural flow of self-expression, which is that wonderful feeling of Love and Joy. Every step of the way, your Mind will be learning how to deal with increasing complexity and how to integrate new understandings. Note that ‘Love’ and ‘Inner Joy’ will continue to challenge you until you have completed enough of your Healing Journey. How this whole process plays out will be unique to you but keep focusing on the destination… a Loving, Joyful, Vibrant Life.